In Minecraft, wandering around in the open usually isn’t a problem during the day, but the environment becomes much more dangerous at night. If daytime minutes are waning and you don’t feel ready to fight back (which is probably true on your first day), you need shelter. 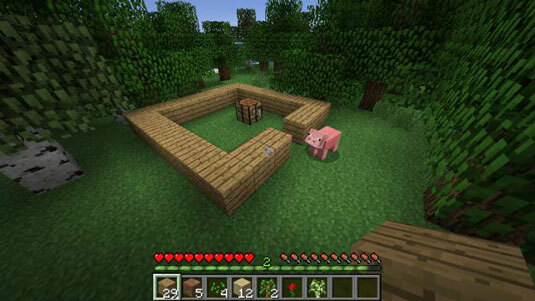 By placing many of the blocks you’ve gathered, you can build shelters, houses, and other structures. Find a good building spot. Flat spots are the easiest to build on, but you can find any spot that you think is feasible for a house to fit. Remember that you can break and replace dirt, sand, and other blocks to flatten a rough area. Select a block in the inventory with the 1–9 keys, and then right-click a nearby surface to place it there. Place several blocks in a comfortably sized outline for your base of operations, as shown. Usually, the frame is a rectangle made of wooden planks, but you can collect blocks such as dirt and use them for building in a pinch. You also need a door, so you can leave 1 block out of the rectangle to make room for it. 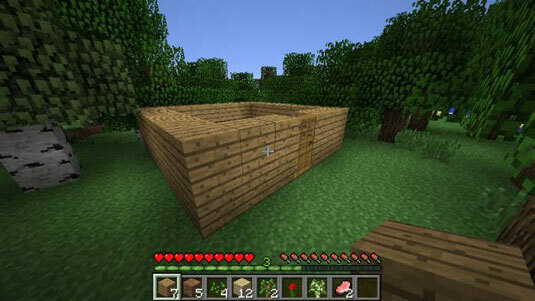 You can also build the rectangle around the crafting table and chest so that you can work from inside your home. Place a second layer of blocks on top of the first layer. A structure that’s 2 blocks tall is sufficient to keep most monsters at bay. Right-click the crafting table to open the crafting grid. Arrange six wooden planks in two adjacent columns of the crafting grid. This arrangement is the recipe for a door. Move the door to the bottom row of the inventory. Place the door in the wall of your shelter by right-clicking the ground where you want it. You may have to break open part of the shelter wall to fit the door. Right-click the door to open (and close) it. When you place a door in front of you, the door is positioned to open away from you when you right-click it. Usually, a door is placed from the outside of a building so that it opens toward the inside. The figure shows a finished shelter with a door. To place a block beneath you, jump into the air while right-clicking and looking straight down. This popular method for building and scaffolding is referred to as pillar jumping. If you repeat this strategy, you can effectively rise upward on a pillar of blocks, which is useful for building taller structures. That’s it — generally, a basic shelter can ensure your safety for the night.